Lipid molecules have split personalities—one part loves water, whereas the other avoids it at all costs. Lipids make up cell membranes, the frontline defense in preventing cellular access to bacterial and viral invaders. Many researchers believe that the membrane is not just a scaffold where proteins reside, but instead actually plays an important role in a number of biological processes. Researchers are also starting to see that lipids and proteins can form small patches, similar to a mosaic. This patchiness seems to have a functional role in the life of a cell and in regulating its different processes. Functional patches of lipids are commonly referred to as lipid rafts. 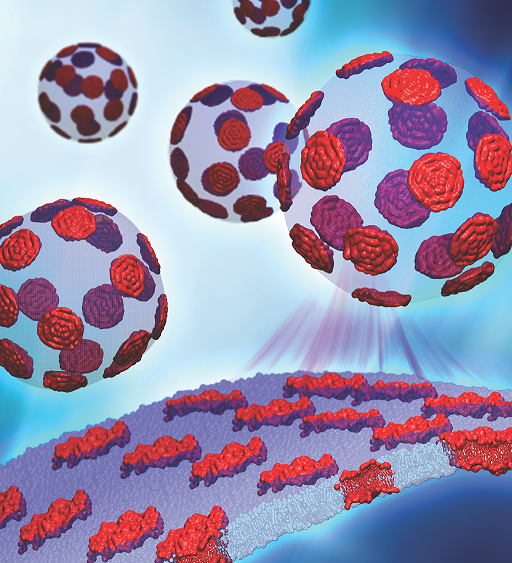 To better understand the biological processes that govern lipid raft formation—processes with broad implications for research ranging from how cells regulate proteins to how viruses invades healthy human cells—researchers at Oak Ridge National Laboratory (ORNL) are using two world-class research facilities to study the presence and formation of these nanoscale lipid patches. Researchers used the Titan supercomputer at the Oak Ridge Leadership Computing Facility (OLCF) and the Neutron Spin Echo and EQ-SANS instruments at the Spallation Neutron Source (SNS) (both at ORNL) to understand membrane organization and how it affects biology. In the near term, the larger team seeks to determine the presence or absence of lipid rafts. Work was published in Journal of the American Chemical Society.